Western blot analysis of whole cell lysates probed with CD63 antibody followed by detection with Goat anti Rabbit HRP conjugated (1/10,000, STAR208P) and visualized on the ChemiDoc MP with 119 second exposure. Arrow points to CD63 (molecular weight 30-65 kDa). CD63 antibody recognizes CD63, also known as CD63 antigen, granulophysin, lysosome-associated membrane glycoprotein 3, melanoma-associated antigen ME491, melanoma-associated antigen MLA1, ocular melanoma-associated antigen, tetraspanin-30 or tspan-30. Rabbit anti Human CD63 antibody recognizes the CD63 antigen, also known as granulophysin, lysosome-associated membrane glycoprotein 3, melanoma-associated antigen ME491, melanoma-associated antigen MLA1, ocular melanoma-associated antigen, tetraspanin-30 or tspan-30. The protein encoded by CD63 is a member of the transmembrane 4 superfamily, also known as the tetraspanin family. Most of these members are cell-surface proteins that are characterized by the presence of four hydrophobic domains. The proteins mediate signal transduction events that play a role in the regulation of cell development, activation, growth and motility. The encoded protein is a cell surface glycoprotein that is known to complex with integrins. It may function as a blood platelet activation marker. Deficiency of this protein is associated with Hermansky-Pudlak syndrome. Also CD63 has been associated with tumor progression. Alternative splicing results in multiple transcript variants encoding different protein isoforms (provided by RefSeq, Apr 2012). 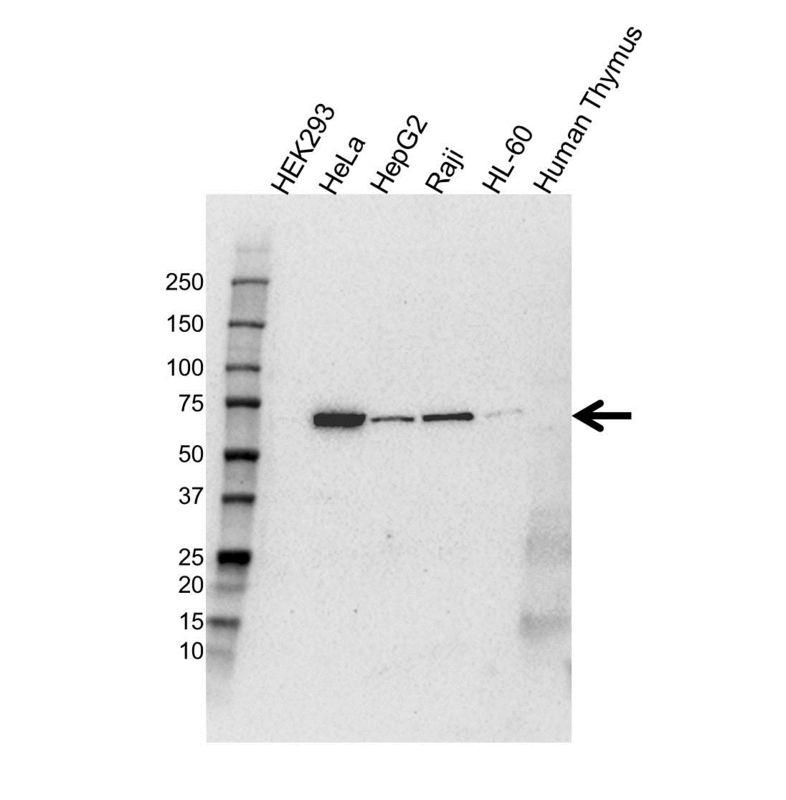 Rabbit anti Human CD63 antibody detects a band of 30-65 kDa. The antibody has been extensively validated for western blotting using whole cell lysates.